Being a great hostess during the holidays doesn't have to be hard or stressful! Some of the best gatherings happen spur of the moment and today I want to give you a quick guide of easy tips to be prepared for a great party. Follow my suggestions and you'll be the hostess with the mostess! If you've decided to throw an impromptu gathering or you're just pressed for time, my tips will guarantee an (almost) effortless gathering. Always keep your home ready! This requires daily picking up, but it makes a huge difference if unexpected guests stop by. Staying on top of cleaning and decluttering will keep your stress levels to a minimum! Keep the dishes out of the sink and recycle the newspaper and mail. Have a bottle of Champagne or Prosecco chilling at all times! 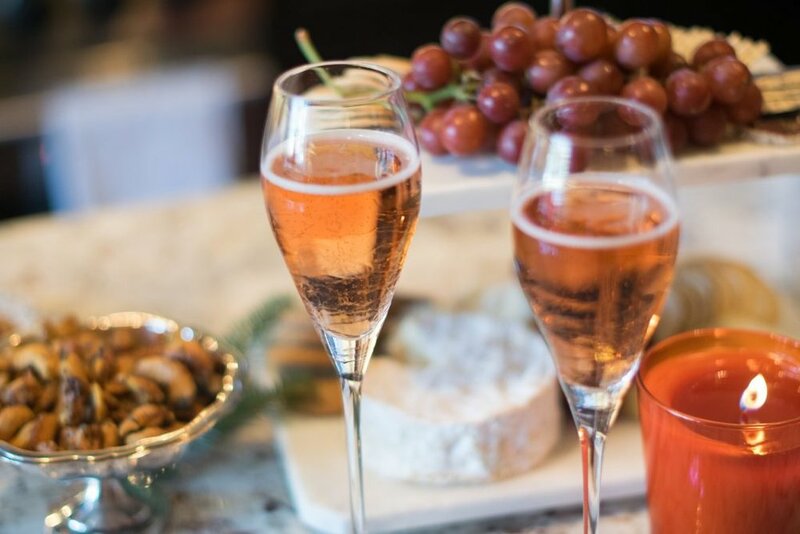 Everyone loves bubbly and it goes with every kind of food. Have glasses ready to go and your party is instantly off to a great start! Keep your pantry and refrigerator stocked with ready to serve treats. Having an array of cheeses and crackers on hand as well as frozen desserts such as decorated sugar cookies or mini cheesecake bites will make a beautiful and delicious spread! If you don't have a local bakery that makes beautiful sugar cookies, try Eleni's New York for a fun assortment. Watch my video on How to Make a Cheeseboard if you need inspiration. Also, sign up for Crazy Blonde Life emails and receive my free ebook, Easy Hors'doeuvres for the holidays! Have the perfect holiday playlist. Music is important for creating a mood and setting the stage for a fun evening. Choose music that is pleasing to most people. You can't go wrong with James Taylor or Frank Sinatra, but I also love the three below for updated classics. Light a candle to create an ambience thats inviting. Place candles away from food and choose a seasonal scent that isn't too overpowering. It's a nice touch that makes your home feel welcoming. Finally and maybe most importantly, relax and enjoy your guests! If you are uptight they will be too! We're on the countdown so I hope my guide will help you to be a stress free hostess! Follow me on Instagram @crazyblondelifeblog.